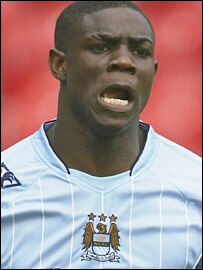 Manchester City's England defender Micah Richards says he is close to signing an extended deal at Eastlands. Richards, 19, who already has a contract that lasts until 2010, hopes to agree new and improved terms. "I am very happy at City," Richards told BBC Sport. "Hopefully we will have something signed very soon. "I am just waiting for my dad who is in Africa setting up a soccer school. We have got talks with City as soon as he gets back in the next two weeks." Richards has been one of City's star performers in Sven-Goran Eriksson's new-look side this season and he has also won four England caps under Steve McClaren. "To me the most important thing now for my England chances with Euro 2008 coming up is to be playing week-in week-week out," added Richards. "If I am at City then I am hopefully going to be doing that, so it will be the best thing for me. "I have been offered a new contract and, although I have not signed anything yet, it should be sorted out soon." City won their first three games of the season and, although they have lost their last two matches at Arsenal and Blackburn, Richards - who started his new column with BBC Sport this week - is still enjoying life at Eastlands. "It has been great working with Sven although he is very different to our last manager Stuart Pearce," Richards explained. "Pearce was more of a motivator - getting everyone going. Sven is more of a chilled out guy. "People do things in different ways. When some people speak they don't have to shout but you know what they want of you so you just go out and do it. "Sven has just told us to do what we do in training during the game and to relax and enjoy our football. He wants us to do what we are good at and he puts no pressure on you. "He says what he needs to say and you listen. He has spoken to all of us individually and told us that if we give 100% then anything is possible. "It is an exciting time at the club but I wouldn't take anything away from Stuart Pearce either. We have a new owner and Sven has a lot more money to spend than Stuart had. "But a big-name manager likes Sven attracts big-name players, which is what has happened." "We are aiming for the top 10 at least but things are not going to happen overnight," he added. "In our first three games we got the results. The last two games have not been so good but it is a long season. "It's not like we didn't give 100% at Blackburn and going there is a very hard game. They have got a good set of players and they look like being a top-six side. "We did well to get nine points from our first three games so you can look at it both ways. Before the season started we would have taken having nine points from our first five games."